My boys love horror movies and asked if I would let them be scary for Halloween. Being an avid horror movie lover myself, I agreed. 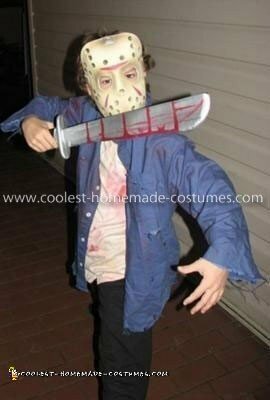 My eldest twin loves Jason and couldn’t wait to be him. I thought that having his twin play Freddy would be a great play on Freddy vs Jason since the twins constantly fight anyways. My youngest son who is 4 likes to be just like his brothers so I chose Chucky for him… Good chucky though as I didnt want him to look scary. For Jason, I bought the mask and sword. I took old clothes of my son and soaked them in tea and fake blood. I also cut strips and holes into the clothes to make them look more ragged. For Freddy, I bought the red sweater and spray painted stripes on it. I made the glove out of cardboard, tinfoil and a black one size fits all glove. He could move each “blade” individually. I also did all his makeup using latex and face paint. 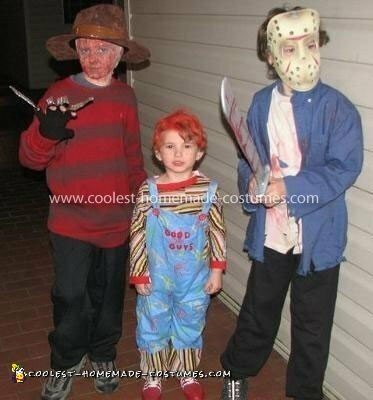 Chucky’s costume is all handmade. I bought all the fabric from the fabric shop and sewed the overalls first. I glued the good guys onto the pocket to make it look more authenic. I couldnt find red shoes so I bought light colored ones and spray painted them red. Then added the white stripes. I added extra layers under his shirt so that he didnt have to wear a sweater and wouldnt get cold. I then dyed his hair red and added some freckles.